Heat 2 tbsp oil in large nonstick skillet set over medium-high heat. Season chicken with salt and pepper, sauté for 5 to 8 minutes or until browned. Transfer to a plate. Heat remaining oil. Add onion, celery, butternut squash, garlic, creole seasoning and thyme; sauté for 3 to 5 minutes. Add zucchini and red pepper; continue to cook for 3 to 5 minutes or until vegetables are tender crisp. Add chicken, corn, edamame, grape tomatoes and broth. 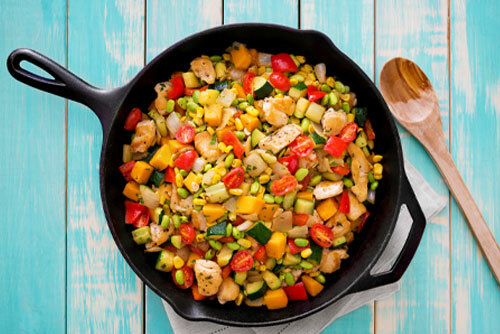 Cook, stirring for 3 to 5 minutes or until vegetables are tender and chicken is cooked through. Stir in parsley. Serve over bed of quinoa or brown rice, if desired.